...So you want to be a gorilla man?part 6...Mighty Monkey Muscles !!! Long time ( too long ) no see ! Well this should be enough of a break to have finished your head by now...Yeah, 2 and a half years should do it ! 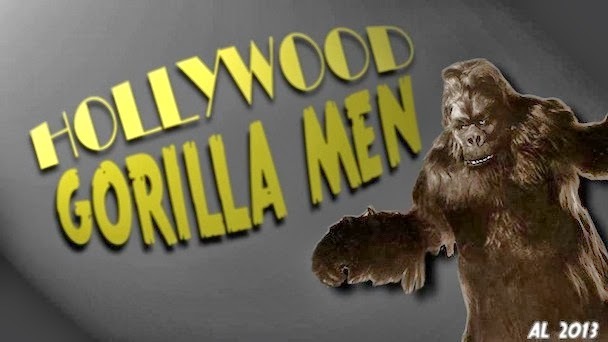 It's amazing how the real world can throw a wrench into a cool gorilla suit tutorial. 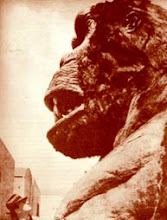 As you may remember, a long long long time ago, we had just finished our awesome Gorilla head ! Now at long last, we can start on an equally impressive body ! Lets start out with a basic form to build up upon...something shaped like a human body,,,,I know ! Let's use...your body ! Now, unless you are a genetic mutation of some sort, chances are pretty good you aren't built like a gorilla...lets hope you aren't a mutation ! 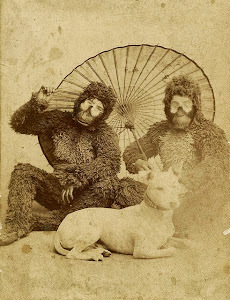 Not that that's not cool and all, I mean being shaped like a gorilla would definitely make wearing an ape suit a lot easier...and a lot cooler... But I digress ! Let's assume you are built more or less like a human being. Now in order to be built like a gorilla, we're going to start the ultimate muscle building program ! No, not like Arnold Swarzenegger or Lou Ferrigno, I'm talking about BUILDING the muscles ! Now, we've seen how Chris Walas built up his gorilla muscles using shaped foam rubber, glued down in layers to create the gorilla shape. I've used this technique before, and while extremely effective, I chose a different route...because "A" I wanted something lighter, and easier for me to move around in, and "B" I didn't want to do the same thing Mr. Walas did...because that would be be redundant, and limit your options ! And since the entire objective is to give you options, here we go ! The following technique was imparted to me by the legendary Bob Burns, and the equally legendary Kathy Burns ! Essentially what we're going to do is to make specially shaped pillows using fabric and Polly-Fill . Poly-Fill can be found under several names, like Fiber-Fill, but it's basically a white fluffy fiber for stuffing pillows, cushions, stuffed animals, and monkey muscles. SPOILER ALERT !!!! You'll need to be able to sew ! If you can't, then ask your wife, girlfriend, mother, or cosplay friends... This is definitely a job for a sewing machine ! First things first, you'l need help for this part. With your arms out straight measure from one mid forearm around the back, to the the middle of the other forearm. Write this down because if you're like me, you'll forget before the next step. Write in inches, like it shows on most cloth measuring tapes, like 48 inches instead of 4 feet....it'll save you aggravation with the math later on. In my case it's 45 inches. Now the next number is a little trickier. If you are 160 lbs or less, write the number 16. If you are over 160 write the number 12. The reason being, the thinner you are, the thicker the padding needs to be...logical right ? As you've probably guessed, the second number is also inches. Using a semi-stretchable fabric ( like t-shirt material ) in the same color as your suit...black suit, black fabric..you get the idea. Now using a yard stick to cut straight lines, Cut a long strip of fabric the same width as your second number you wrote "18 or 14 " ) for demonstration sake, we'll say 14 " as I'm on the thick side. So once I've cut my 14" strip, I now cut that to my measurement of 45" long. I now have a rectangle 45" long by 14" wide. Now take the long strip and fold it in half on the short side, so in my case, I now have a rectangle 44" long, by 7" wide. On the part were the folded over piece meets itself again, sew along that long line , and leave the needle 1/2 inch from the edge ( called the Hem line. Now in my case, I now have a cloth tube 44 inches long. Now turn it inside out so the hemline is on the inside of the tube. Now from each end, start stuffing The Poly-fill toward the center of the tube. Stuff it firm enough to hold a round shape after giving it a squeeze, but don't pack it tightly, you will need to conform the shape around your body contours. Okay, take a deep breath...get a drink...in short, take a wee break. Here, young Bob Burns shows us what it looks like. In this early version, Bob would use several string ties to hold it in place. You can see how massive this simple shape makes you look ! 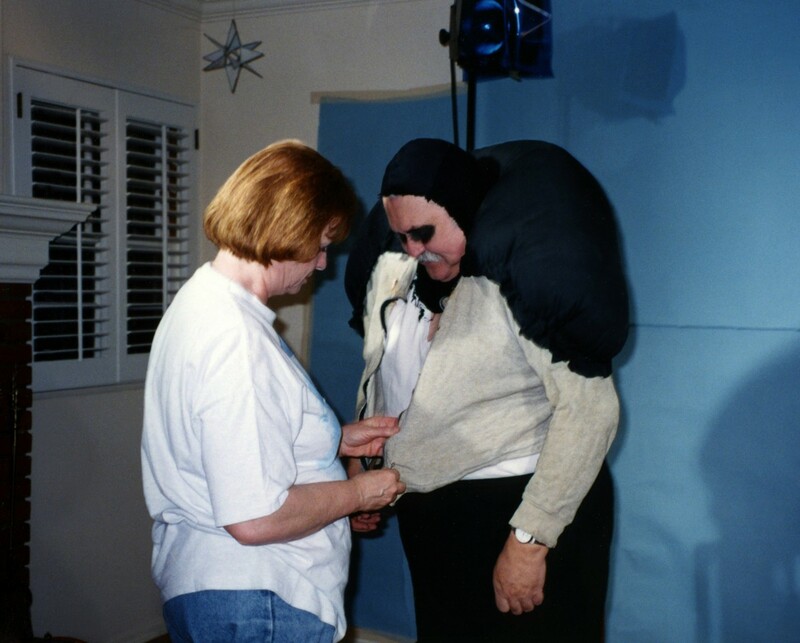 This method served Bob well for many years, but eventually the padding moving around in the suit would become a huge pain in the buttocks. So Kathy, showing her sewing savvy suggested permanently attaching the pad to a sweat shirt, by sewing it into place.. Voila ! It worked like a charm ! This is what the pad looks like sewn down to the sweat shirt. 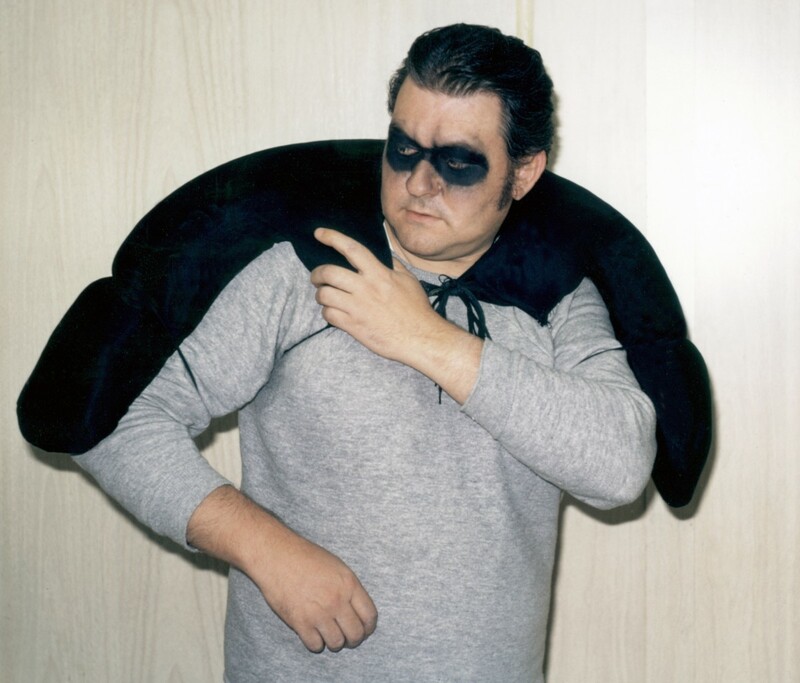 After Bob describe the method with these photos, and the advantages it has over foam, this was what I eventually duplicated for my black Bongo suit. The amount of mass this conveys in incredible ! Note that the pad comes almost to the top of our respective noggins. This way, like a real gorilla, you head will merge into the shoulders and giving the illusion of an actual huge gorilla neck musculature . what were the advantages Bob and Kathy mentioned you ask ? Well, one is the weight ...The fiber-fill is almost weightless ! Two, is flexibility..Because the Fiber-fill compresses so easily, your range of motion is barely affected by the padding ! The third and most important advantage is the entire under-suit is washable !!! In past suits where I used glued in foam padding , once you soaked the foam with sweat, it was there to stay ! After wearing it a few times, you'd start to dread climbing into that wretched smelling suit...And let me tell ya, that is a stench you'll never forget ! A word on this : Proper hydration is the most important thing in the world to you when in the suit for any length of time. You literally sweat it out as fast as you can drink it. The serious danger here is sudden onset of dehydration, and possibly heatstroke. Yes it gets that hot ! It can be in the 70's temperature wise, but inside the suit, your cooking away at 90 to 100 degrees ! So, please keep that in mind when you are wearing any type of costume that completely encloses your body ! Hydrate, Hydrate, Hydrate ! at least one gallon of WATER an hour....Believe me, you will be thirsty enough to do it. In one movie shoot I did, over the course of three hours, I drank 3 gallons of water, and never had to pee once ! 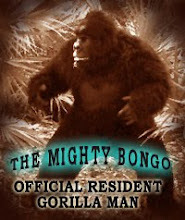 I want my new gorilla brothers and sisters to be healthy gorillas ! Now where were we...Oh yes, preventing the stench ! With the fiber-fill padding, you simply remove the sweat soaked under-shirt and toss it in the washing machine like any other laundry. I've washed mine about 30 times and I've only had to fluff up the padding about three times, by squishing the polly-fill through by squeezing it around by pressing your fingers into the flexible cloth, then pinching the stuffing inside and pulling out on it. Another good rule of thumb is to bring one t-shirt for every hour in the suit. These will catch most of the sweat , then once you're soaked, pull the soggy shirt off, and put a fresh one on. You'll thank me for it ! Same ape time, same ape channel !